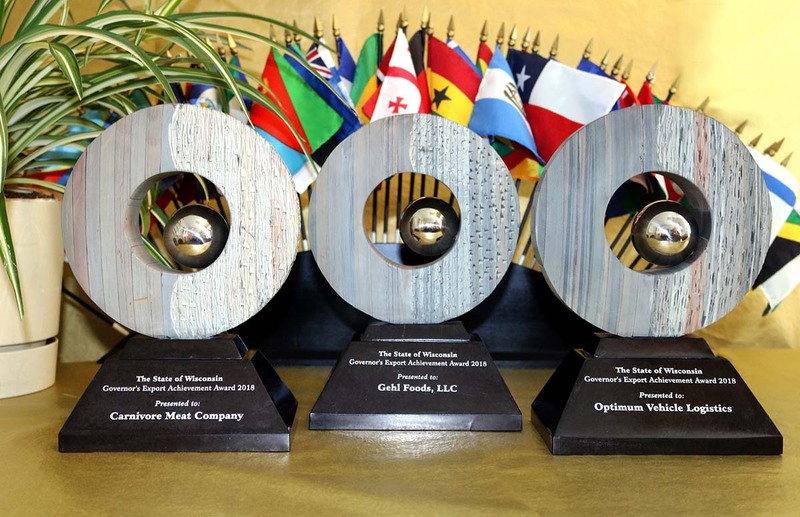 Three Wisconsin companies—Carnivore Meat Co. of Green Bay, Gehl Foods LLC of Germantown, and Optimum Vehicle Logistics of Milwaukee—have been named the recipients of the 2018 Governor’s Export Achievement Awards. Carnivore Meat Co. is a fast-growing maker of pet food, specializing in raw food. The company’s flagship consumer brands, Vital Essentials and Vital Cat, make up the fourth-largest brand in this niche with frozen and freeze-dried entrees, treats and snacks for dogs and cats. The company’s export sales grew from $25,000 in 2015 to $632,000 in 2017, and the company projects export sales will reach $4 million in 2018. Its workforce grew by 69 percent in 2017 and is expected to increase by another 50 percent or more in 2018. The company was founded in 2012, after CEO Lanny Viegut purchased the business assets of Green Bay Pet Food Company. After that company fell into financial distress, Viegut was brought on in 2009 to preserve and strengthen the struggling company’s raw pet food business. Since then, the company has developed many new, unique and innovative products, including many “first-to-market” pet food options not offered by any other manufacturer. Its products are made with no added hormones, antibiotics, fillers, flavorings, artificial preservatives, colors synthetic vitamins and minerals, or rendered byproducts. Carnivore Meat has taken steps to optimize its products for international markets, such as obtaining EU quality certification for its products, as well as researching and complying with varying international standards for ingredients and processing. The company has attended trade shows in China, South Korea, Germany and Canada, as well as the U.S., to forge international connections. The company has agreements in place with three distributors in China, two in Japan, and one each in Malaysia, Vietnam, Panama, Bahrain, Switzerland, Canada and Mexico. These distribution partners work directly with retailers to develop point-of-sale materials such as brochures and signage in the local language. So far, the company has trademarked its name in Japan and Spain. Carnivore Meat received an International Market Access Grant from WEDC in 2016 to help support these export growth activities. Gehl Foods was founded 121 years ago in Milwaukee as a local creamery and butter processing facility. Today, with locations in Germantown and in California, the company is an industry leader in diverse, high-quality, low-acid aseptic dairy product manufacturing. The export team focuses primarily on cheese sauce and nutritional beverages, two fast-growing categories globally for which the company has ample manufacturing capacity. The company’s main distribution channels for its cheese sauce are convenience stores, stadiums, movie theaters and quick-service restaurants. The company also makes a cheese dispenser that heats the cheese to, and maintains it at, a safe temperature for consumption. Its proprietary design is compact and uses 60 percent less energy than competitors’ dispensers. Gehl’s nutritional beverages for the adult nutrition, diabetic nutrition, pediatric nutrition, weight loss, low-carb nutrition, sports nutrition and protein nutrition segments are sold in plastic bottles and Tetra Paks. The company’s international division is developing private label brands for sale in Latin America, including Mexico and Colombia, among other markets, focusing on packaging styles and flavor profiles specifically developed for those markets. Since 2015, Gehl Foods has made four key hires with international experience to help guide the company’s export growth strategy. Since then, the company leased new warehouse space specifically for export inventory and shipping processes; hired local professional designers to outline, translate and create labels for new international customers; and hired Milwaukee-based M.E. Dey & Co. to handle freight forwarding, including export compliance. The company has taken advantage of the ExporTech™ program as well as WEDC grants and trade ventures to help implement its export strategy. Its export sales have increased 55 percent since 2015, and exports now account for 10 percent of the company’s revenue. Sales currently span 19 countries in addition to the European Union (which comprises 27 countries on its own). Latin America (including Mexico) represents 60 percent of the company’s international sales; Europe 30 percent; and the Middle East 10 percent. Optimum Vehicle Logistics (OVL) was established in 2007 after receiving distribution rights for spare parts support from the manufacturer of the HMMWV. These spare parts have become the company’s flagship product line, and today OVL provides aftermarket spares support for most U.S.-made wheel and track military vehicles, in addition to equipment such as earth movers and material handlers operated by armed forces around the world. Although the company recently celebrated its 10-year anniversary, its executive management has been involved with global parts distribution since 1979. OVL prides itself on understanding foreign business cultures and practices, communicating in the local language, and other important aspects of international business. The company understands the importance of meticulous quality assurance processes, given the cost involved if a product is rejected at customs or by the end user; OVL takes pride in a rejection rate of 0.04 percent. OVL’s first export sale was to the United Arab Emirates in 2008; today, the company has exported to 37 countries on six continents (up from 26 countries in 2015). Exports constitute 98 percent of the company’s sales, and overall sales have increased from $24.2 million in 2015 to $43.8 million in 2017. The company is an authorized distributor for two other Wisconsin companies, Oshkosh Defense and Schutt Industries, and in 2014 received the U.S. Small Business Administration’s Exporter of the Year award. This year’s award winners were recognized at the Wisconsin International Trade Conference May 9 in Milwaukee. Each company received a trophy and a custom-made video about its exporting efforts, as well as additional publicity. Learn more about the Governor’s Export Awards and view videos about this year’s winners.